The Holy Father Pope Francis with the opening of the Jubilee Year of Mercy has lit a fire in many hearts. His desire that “During this year we all go out to every man and woman, bringing the goodness and tenderness of God”, has set people in motion to go out and perform works of mercy. 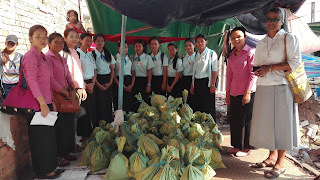 So it is with the Students, Staff and Sisters in Don Bosco Vocational Center, Tuol Kork. The fire is lit! They launched a calendar of activities spread through this year. Several activities were carried out in the month of February and March. Everyone at the Center was committed to collect funds and other items to be brought as gifts to people in need. The girls were divided in groups so as to give everyone the opportunity to experience performing works of Mercy. 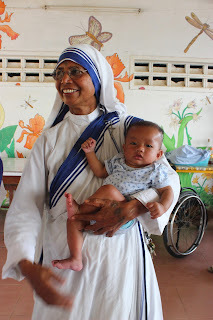 The first group experienced “…bringing the tenderness of God” to the children of “Holy Baby” Orphanage. The over 40 children and staff enjoyed the presence, the activities and formative moment carried out by the students and all was concluded with the distribution of gifts to each and a wholesome evening meal. The next group of students visited the over 60 sick and abandoned elderly and handicapped children at the MC Home. 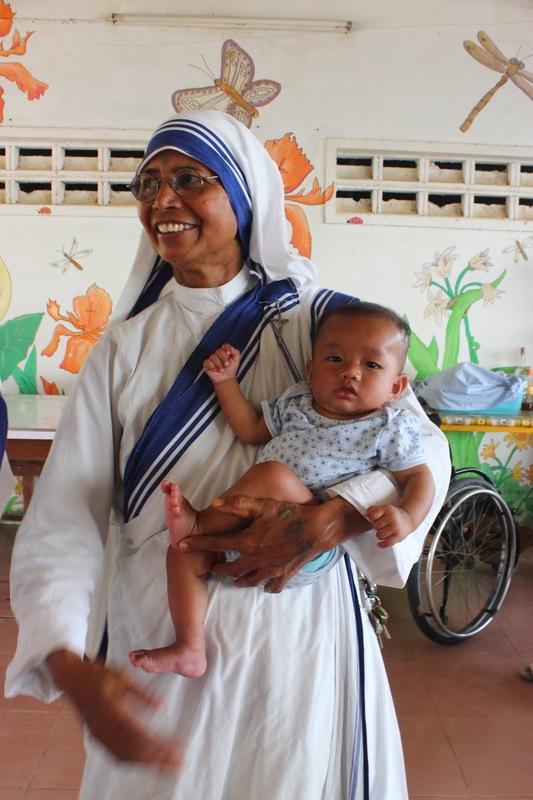 The input of the Year of Mercy, the songs, dances and games brought life and laughter to the children and to the elderly, who besides games, enjoyed videos that elicited the joy, peace and hope of Jesus in their heart. All concluded with suitable gifts for everyone. The accidental destruction by fire of a whole village outskirt of Phnom Penh that left 97 families without their poor abode, engaged everyone at the Center in the collection of food and other items of prime necessity. The visit to the village by another group of students brought relief and support to those families who felt, the touch of Jesus Mercy but also it stirred up in the participants the awareness of the suffering of many people. Besides the above works of Mercy some Sisters and the Foreign Volunteers, having obtained the permit from the Minister of Interior Affairs, visited a prison to meet inmate mothers and their children. The event was most touching as these unfortunate mothers shared their inner drama and the Sisters and Volunteers shared God’s love together with all the material that they had carried to satisfy their urgent necessities. It is hoped that the visit can be repeated other times during the year. It is hoped that Jesus’ words: “Whatever you do to the least of my brothers and sisters, you do it to me” Mt25:40 may continue to resound in the heart of each participant so that the cry of our brothers and sisters may turn solidarity into a style of life for them.